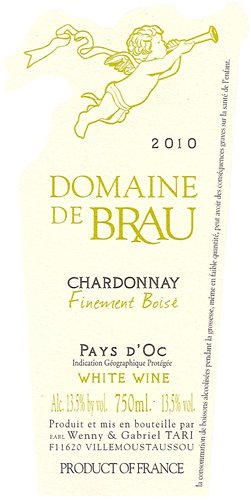 This is a nice value chardonnay from the Languedoc region, a small vineyard north of Carcasonne, France. 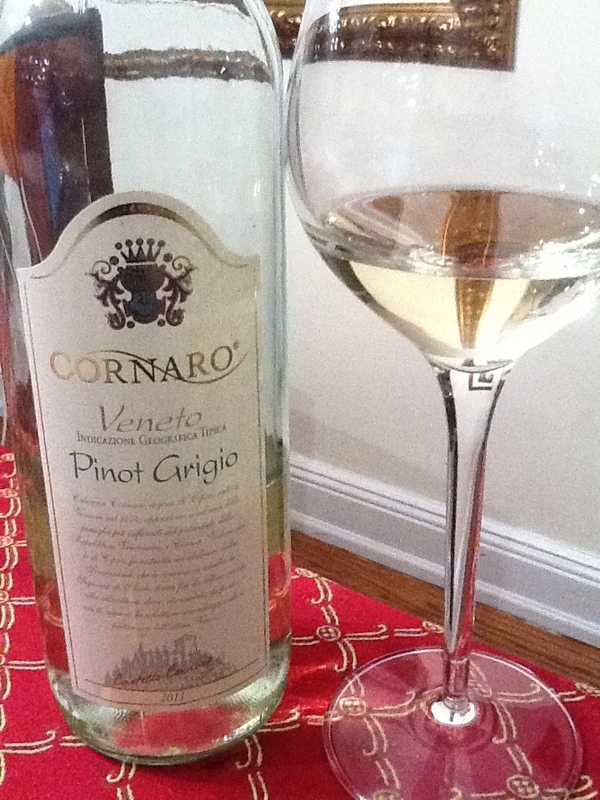 With a straw color and a nose of citrus and herbs, it has a dry palate with a well- balanced fruit blend of pear, apple, lemon, oak, and a touch of sandstone on the gentle finish. Organically grown grapes pressed lightly and aged in 50% new oak comprise this wine with enough body to stand up to rich, savory dishes and powerful cheeses while it can still complement lightly flavored courses of fruit or vegetables. This is a convenient bottle to have on hand when you want a hint of the Mediterranean. Winemakers Gabriel and Wenny Tari have a website and blog with some very personable touches; if you want to explore it all a good understanding of French is helpful while some pages are indeed in English. How often do you find yourself specifically choosing, or refusing, to use certain words when describing wine? We often select and refer to words that conjure up sense memory, but there are times I may select a word and find myself promptly removing it and choosing a different approach or descriptor. Several of my rarely-used descriptors originate from the stables: horses, saddle leather, horse sweat, manure, alfalfa pellets, oats, freshly plowed track soil, and variations on these. Many of these words or phrases elicit negative connotations to me, hence my reluctance to use them. For example, the word “oily” simply feels negative to me while in the right situation it might be an ideal quality, like a properly aged baseball glove or the expected phrase, “a well-oiled machine”. One of the things I find interesting is that the words may not have similar reactions from others. I actually find saddle leather and gun oil comforting odors, and I have seen people put their nose close and drink the smell in deeply from a leather jacket in the same way I inhale the scent from a luxurious red. Perhaps the odors of the American West oppose the ideas formed during my French wine education? 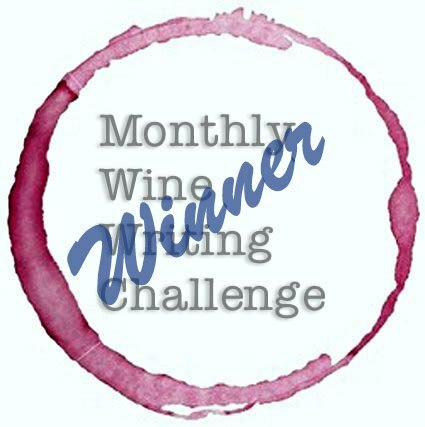 In recent weeks, I have tasted several new reds, several old reds, and a handful of various wines that I’m incorrectly calling “winter” whites. They are only winter white wines to me, when in warm weather I enjoy a glass of white regularly I tend to ignore them during the cold months and stay with heavier flavors such as single batch bourbons or single malt scotch as a cocktail before a glass of red wine served with dinner. What words I use to describe the season in which I try a wine has nothing to do with the winemaker’s intention, and a phase like ‘gun oil’ or ‘saddle leather’ might elicit a warm, fuzzy feeling to one reader and a negative image or memory from another. Interestingly, my intent in calling a wine a ‘winter white’ simply implies I enjoyed it out of my normal season for enjoying the grape, in the same way that I often ignore big, bold, complex cabs during the hotter months of the year, and YMMV. My favorite descriptive word is “velvety” which I use for specific quality of odor and mouthfeel I’ve found in certain well-matured Bordeaux, while my least favorite descriptor is “cat urine“, which I’ve used unfortunately at tastings for some very high end Sauvignon Blancs. Tasting a vineyards’ $400/bottle premiere cru that has a strong odor of cat urine can be off-putting for many people. I knew something was amiss when I saw it was the only wine, and a white wine at that, decanted at the tasting! If you’re not an avid reader of Robert Parker, you might not know about his glossary of wine terms, which can be a great reference. What are your least or most favorite wine descriptors? 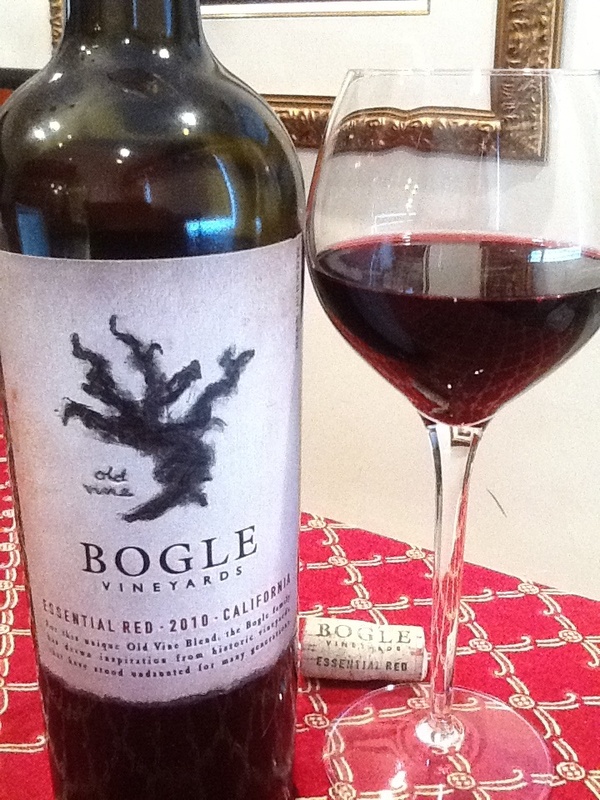 Bogle Vineyards Essential Red 2010, Clarksburg, CA. $10/bottle, purchased from Mayfair Wine & Liquor, Queens NY. A blend of old vine zinfandel, syrah, cabernet savignon and petite syrah. “Unlike anything we’ve made before…” says the back of the bottle, aged in French and American oak for 18 months. I saw this at one of the local wine stores and remembered liking their ’09 Cab Sauvignon served by the glass at a restaurant. The words ‘old vine’ made me stop and look, the front and back labels peaked my interest and the price was right. Nice marketing, Bogle- it stood out to this Bordeaux snob right away. I thought it might be the right wine to try on game day, with the chill in the air and several dishes that might be hard to pair with a single wine. Powerful nose of cassis, tobacco leaf and spices. On the palate, there is big, bold fruit: cassis, plum, and cherry with notes of spice box, clove, and a touch of vanilla. Nice acidity in the mouth. The flavors were very spicy on the top palate, noted heat from the alcohol, some tobacco and hint of oak. Sweetness from the syrah is present on the finish. 13.5% alcohol. You can find the Bogle Vineyards website and more info on this wine here. My hunch was right, this is a great game day bottle. For the money, this is a nice wine, made even better at the price. Perfect for football or days when you want a spicy wine with a hint of sweetness that will pair with any kind of sports food, from pizza to wings, pasta to meat, it’s easy and enjoyable- an easy touchdown for any friendly get-together. A smart add to your cellar or fridge, when a blend of spicy red grapes is the perfect balance to go with just about anything. 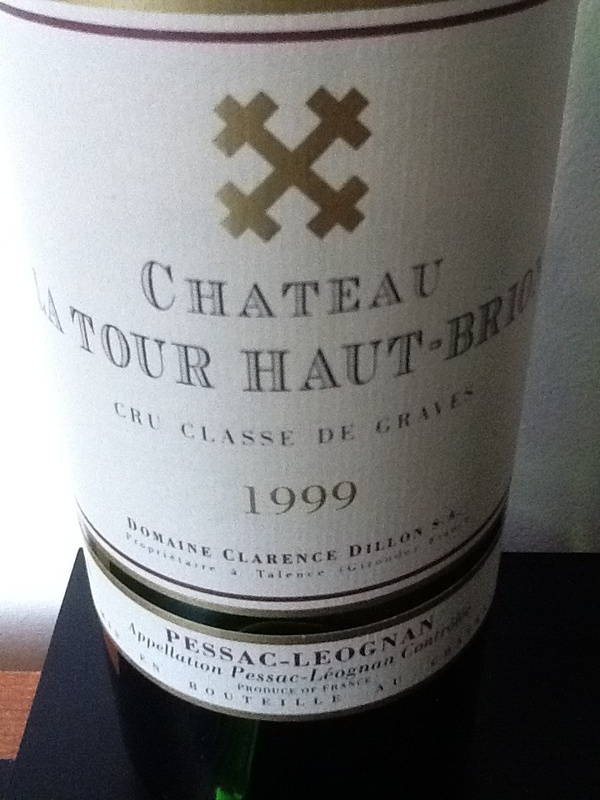 Chateau La Tour Haut-Brion 1999 is a Cru Classe De Graves from Pessac-Leognan, located on the left bank of the Garonne river in the Bordeaux region. Deep ruby to garnet color with slight browning on the edges. Nose includes mature fruit with herbs, tobacco, oak, and spice. On the palate, muted cassis with some violet and lavender notes, leafy tobacco, wet earth, musk, spice, and wood. Features a long, lovely finish. 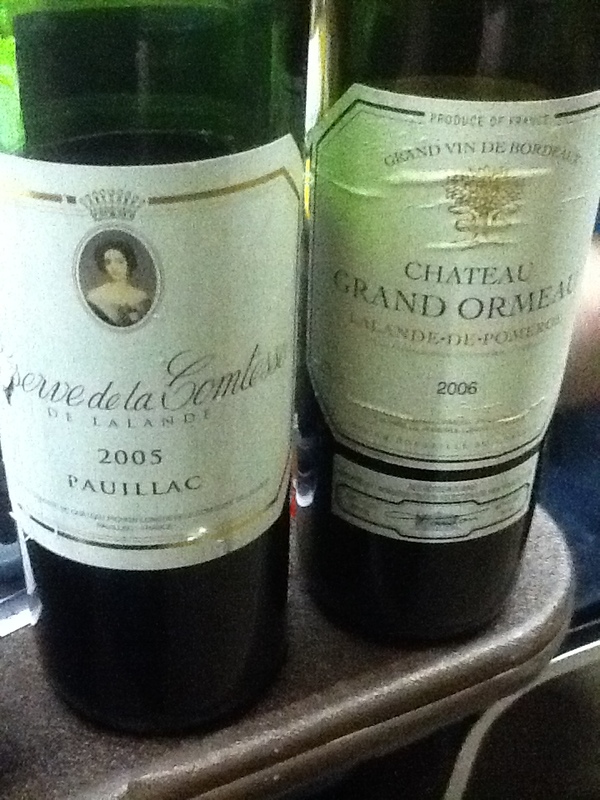 This wine is medium in body but refined, structured, and classic Bordeaux. This is a great example of a wine that shows all the elements of a great wine with age and depth. Decant for maximum enjoyment. I purchased this bottle more than two years ago for around $80 put it in my cellar. When I finally drank it, I was very pleased with the purchase. Now, to me this is an expensive -but not an insanely expensive- wine for price, taste, and value. It is, quite simply, very well made, from quality vines, that are grown in quality terroir. During its lifetime (more on that below) the wine consistently rated in the very high 80’s to low 90’s, depending on which high end opinion you endorse. In my opinion, it is delicious, refined, and perfect to share with friends on a special evening. When this wine was originally released, La Tour Haut-Brion sold in the $30’s. If you can find it today, it commonly sells for around $100/bottle or more. This is a desert island wine for me- something I could appreciate time and time again, with just about anything, or with nothing at all. But it has to be desert island, because it could never be a regular wine for me- it is simply too far beyond my normal price range. And because there is no more production of this second wine (there are others from the Chateau), when it’s gone, it is gone for good, and we’ll have great memories to share. While $100 feels expensive to me, it is actually a bargain in comparison to the wine’s big sister. 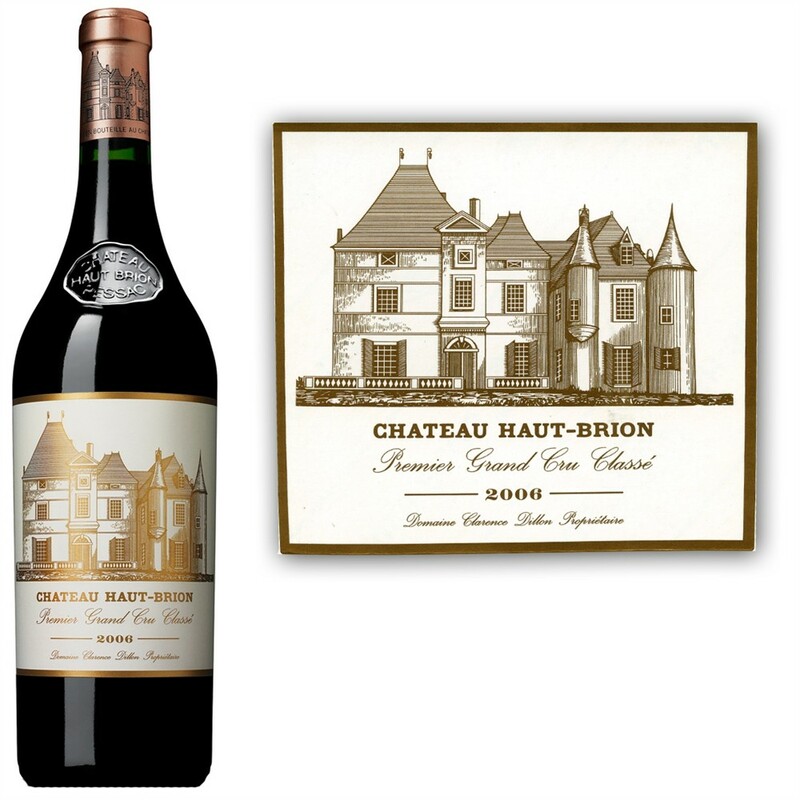 For sake of comparison and to know why I moan about the general public not being able to afford first growth wines, the same vintage of their ‘first’ wine, Chateau Haut-Brion 1999, rates around 92-94 points, and is selling between 400-700 per bottle if you can find it. The current top vintage -the stunning 2009- rated at 100 points and I saw recently priced at $1225/bottle. I have a picture of the 2006 (below) which is selling for $550, while the 2011 (which will be released in 2014) is listing at $575 (in advance) from retail stores. As I hinted previously, this wine is no longer made. La Tour Haut-Brion’s final year of production was 2005. The grapes from 2006 and beyond have been used in the creation of Chateau La Mission Haut-Brion. There is actually a decent wiki about Chateau La Tour and its history you might enjoy, and another about Chateau Haut-Brion itself. This wine is a perfect example of the wines I want to be able to buy and enjoy, but are simply on the edge of being too costly for most wine drinkers. I want my higher end wines to be no more than $50-$80. (I can dream!) If I’m spending over a hundred dollars on a bottle, it should be either a very nice restaurant bottle or something very special to me to be enjoyed at a special moment. What’s YOUR favorite desert island wine?